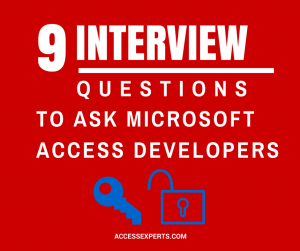 Recently we’ve been interviewing a lot of Microsoft Access Developers, we don’t like to ask your run-of-the-mill questions like, ”Tell me your three strengths and three weaknesses,” or ”What’s your dream job?” Aside from our vacancy actually being your dream job, we’re less interested in the fluff and more interested your level of VBA skills, what you can do and whether you have extensive consulting experience. Whether you’re hiring a MS Access Developer or you’re a developer looking for new opportunities, review these questions and test your skill-set with VBA. Leave a comment below with your answers. Anyone who has all 9 correct will be entered into a raffle for a $25 Amazon gift card. Selection of the winner is final and not subject to review. Contest not open to employees or consultants of IT Impact, Inc.
1. A Collection is an object, that contains an ordered set of items that can be referred to as a unit. The items need not be related, and can be of different types. 4. Many objects have a tag property. E.g. controls, on which you can store custom properties in a string based format. 6. False, The tabledefs collection represents all tabledefinitions, whether linked or local. 8. You can use recordsetclone object of the form to do searches without moving away from the current record. 9. The bookmark is a pointer to a specific record in the recordset, and can be used to navigate back to that record. The recordset and recordsetclone share the same bookmarks. Requery of a recordset renders a stored bookmark useless. I like this post, but I think I’d do it a little differently. If I were to interview an Access developer I’d only ask the really practical questions that show someone’s hands-on experience, i.e. 4, 7, 8 and 9. I’d also ask them how they would make forms multi-lingual and how they would mail merge an invoice with several invoice lines to Word. Oh, and I’d also ask them if they play an instrument. I’ve noticed a strong correlation between good coders and musicality. Thanks for the fun quiz, sure beats some of the funny interview questions some places ask. Some of us use SQL Server back-ends with DSN-Less connections created with code. 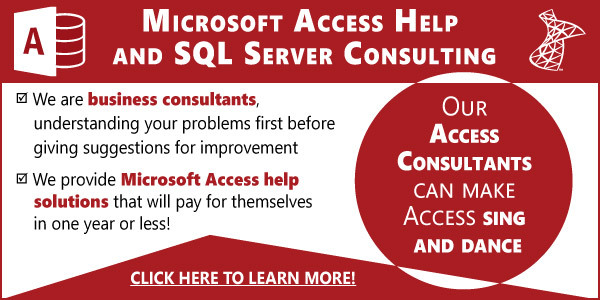 A set of questions for Access using SQL Server would be interesting too. Maybe top it off with a VBA remote automation question for the Excel Object Model. 1) It’s a set of objects that share the same characteristics. Actually a collection does NOT need to contain the same type of objects. You can place both a form and a report in the same collection. By the way, when can you upload the video for the last Access Europe Group? Well…its a matter of word mincing here I guess. The “known” collections in Access such as the Forms collection, the Reports collection or the Controls collection all contain objects of the same class. But that doesn’t mean that a collection you create must adhere to the same principles. It can contain objects of different class’s. That said, I think from a maintenance perspective, in most cases it makes sense to store only 1 type of objects in a collection. Maybe someone has a good example of a good use to deviate from that philosophy. @the video: I have it loaded in camtasia, just haven’t edited it yet. But thank you very much for your interest. 1. What is a collection? A grouping of objects. Each grouping is named and the properties are also named. Access knows them. 2. What property does every object in MS Access have? A name. 3. What is the name of the collection housed inside a form? Controls. 4. What is the tag property and how can it be used? A string property tied to a form, report, etc. Can be used as an alternate ID or even to store some fixed information used in the forms VBA, One example is to store a custom message. 8. What would you use the recordsetclone object of the form for? When you don’t want the data to change. You can navigate through it to get values, etc. 9. Mention at least one use of the bookmark property of the form? I use it most often to refer back to a newly inserted record – specially for getting value of an identity (or autonumber) insert. 1. A collection is like a .net list. It accommodates any type of objects along with an optional key field (a string). 4. The tag property is simply a string field that can be used for any data. 5. False it’s only the open forms. 8. Most examples use the clone to find a record and then uses the bookmark property to move the form to the desired record. It can also be used for other “read-only” operations on the current recordset of the form. 9. The bookmark property can be used to identify a record on the recordset and you can move to that record such as in the #8 mentioned search. *any extra points for not using Google? Cudos on a quite good selection of questions for Access developers. I’ve seen quite a few “certification” like tests that in my oppinion include all sorts of irrelevant questions that might only apply to a fraction of projects, but the questions here any Access developer should know about, and they are applicable in just about any project.